Tourney (トーナメント Tournament) is a multiplayer feature in Super Smash Bros. Brawl. 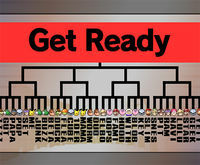 Unlike its Melee predecessor, it now only covers single-elimination brackets - the Winner Out and Loser Out features included in Melee are now part of another mode, Rotation. This page was last edited on October 16, 2018, at 20:27.